Full disclosure time here: I would have liked this post even if it didn’t say good things about one of mine-and-my-husband/coauthor’s own space opera novels (and its sequels), The Price of the Stars. Some time back, I posted a tasting flight of shorter works by important authors, in the interest of giving readers a way to decide whether or not they liked a particular author enough to go on and tackle one of that author’s signature doorstop volumes. Now, as a follow-up to that round, here’s another quartet of shorter pieces by authors of important longer works. Henry Fielding – Joseph Andrews. Tom Jones is the doorstop (and well worth reading for its own sake); Joseph Andrews is the short one, written in response to that other blockbuster of the eighteenth century, Samuel Richardson’s Pamela. Richardson’s novel featured a virtuous maidservant who attracts the lustful attention of her employer, Squire B, possibly the world’s most incompetent rake. He tries everything, including abduction and a fake marriage, but never works himself up to doing the actual deed; meanwhile, Pamela steadfastly holds out for honorable matrimony or nothing, and – spoiler alert! – gets her way in the end. Fielding, for his part, found the entire plot so silly that he responded to it first by writing Shamela, an outright parody, and then by writing Joseph Andrews, which was what we’d probably call today the genderflipped version, with the title character being the handsome young footman who resists the advances of his employer, the licentious Lady Booby, widow of the late Squire Booby (hey, no one ever said that Fielding was subtle! ), and is dismissed from his position and forced to go on the road as a result. Charles Dickens – A Christmas Carol. Charles Dickens was the Stephen King of his day (or maybe Stephen King is the Charles Dickens of ours): He wrote big fat novels, and he wrote a lot of them, for a long time. A Christmas Carol is short, but it’s got enough of the Dickens flavor that you can figure out whether you want to go for one of the doorstops – Bleak House, say, or Oliver Twist. (You can avoid Great Expectations, if you like, and I won’t blame you a bit. It’s the one most often inflicted upon long-suffering high school students, and has probably turned a lot of them off of Dickens for life. Lord knows, it nearly did it for me.) Dickens also managed, with A Christmas Carol, to come up with one of the great recyclable plots. Hollywood, in particular, has been running riffs and changes on it for decades. Thomas Pynchon – The Crying of Lot 49. Pynchon’s another author best known for doorstop novels like V and Gravity’s Rainbow. The Crying of Lot 49 – the title refers to an item being put up (or “cried”, as the terminology has it) for auction – is short and fast-moving, an ideal way to find out of you like Pynchon enough to try the big stuff. Highlights include a centuries-old conspiracy of uncertain intent, a (fictional) Jacobean revenge tragedy, and one of the funniest games of strip poker ever written. Alexander Solzhenitsyn – One Day in the Life of Ivan Denisovich. Russian novels are notoriously long as it is, and Solzhenitsyn carried on with the tradition. One Day in the Life of Ivan Denisovich is an exception, being short enough to be published in 1962 as a complete-in-this-issue novel in the Soviet literary magazine Novy Mir. If you don’t feel up to tackling Solzhenitsyn’s mega-doorstop nonfiction work The Gulag Archipelago, One Day in the Life will give you enough about life in a Stalinist-era Soviet prison camp to be getting on with. As a general rule, when you’re writing in first person, it helps to know the narrator’s assumed reader or listener – that is, the fictional person or persons that your fictional speaker is speaking or writing to. Some first person narrators sound like a person telling their story to a single curious listener, at some comfortable time after the fact; some sound like they’re addressing a group; others use devices such as diary entries, voice recordings, letters, and the like to suggest that the story is being assembled or recorded for posterity in some fashion. Some first-person voices are hallowed by tradition. There’s the reader-I-married-him voice of the Gothic novel, as exemplified by Charlotte Bronte’s eponymous narrator in Jane Eyre, and by the never-named heroine of Daphne DuMaurier’s Rebecca. There’s the noir-tinged private-eye voice of Dashiell Hammett’s Continental Op, or Raymond Chandler’s Philip Marlowe; and the confessional voice of the contemporary memoir. The first person is not without its pitfalls, however. Some readers hold it in visceral disregard, often so intense that they simply will not read a story if they see that it’s written in the first person. Other readers react badly to dissonance between the perceived gender of the narrator and the perceived gender of the author. They are unable or unwilling to suspend their disbelief long enough to accept a male narrator in a story with a female by-line, or vice versa. And if you’re planning to kill off your viewpoint character in the end, first person will make it a hard sell. As always, weigh what you want to accomplish by using the first person against what you may lose if you don’t pull it off as well as you’d like, or if some portion of your readership is put off by it, and make your choice accordingly. Or, how much is “enough”? Personal statement of belief, one each, coming up here. I believe that if you’re going to criticize a work — by which I mean, do a serious and in-depth analysis of its merits and its flaws, or a serious and in-depth examination of some aspect of it, then you have a moral responsibility to read the whole thing. And that responsibility includes continuing past the point where you are certain that you don’t like it and are never going to like it and would prefer that nobody else ever like it either. Serious criticism is serious business, and sometimes that means sucking it up until the bitter end. If you’re going to vote on something, I think that you should at least look at everything on the ballot. This isn’t as onerous a task as it appears, because frankly, for most stuff it doesn’t take reading the whole thing to determine whether you think it’s make-the-cut-worthy or not. Most short fiction shows its true colors inside the first few paragraphs; most novels, inside the first fifty pages if not sooner; and I believe that in this case you don’t have a responsibility to continue past the point where the work trips your personal “life is too short to keep on reading this stuff” trigger. Also: If you’re basing your public “will read/will not read” comments off of somebody else’s reviews, reactions, or analysis, say so, and link if possible. Clear citation is a positive good. From now through the 11th of April, in honor of the arrival of new growth and brighter days, my usual rate for a full line-edit and critique drops back to $1000. 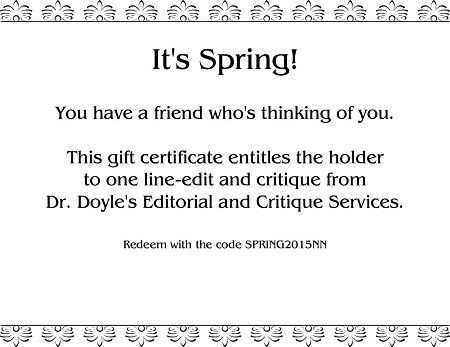 Furthermore, you can purchase a gift certificate for a friend or colleague at the seasonal price, to be redeemed by the recipient at whatever future date they find convenient. The gift certificate comes in the form of a .pdf file suitable for printing out and enclosing in an envelope, or putting into a gift-wrapped box.